SUNY Polytechnic Institute appears in our ranking of The Top 15 Best Affordable Online Master’s in Accounting Degree Programs. Students attending SUNY Polytechnic Institute can study accounting and finance in three undergraduate programs, as well as study accounting at the graduate level. These programs are offered at the Utica campus in New York with the Master of Science in Accountancy being the only program offered online. Students who want to study accounting and have never enrolled in a college degree program can consider the Bachelor of Science in Accounting, which is an excellent place to start for students who want to become Certified Public Accountants (CPAs) eventually. Accounting courses a student will take include Financial Accounting, Intermediate Accounting I, and Cost Accounting. Students will also take several courses in business, marketing, and finance. Students interested in finance have two degrees from which to choose at the undergraduate level. Degrees include a Bachelor of Science in Finance or a Bachelor of Business Administration with a concentration in Finance. The B.S degree is available to first-year students, and the B.B.A. degree is reserved for transfer students. Both programs require that students complete at least 124 credits in areas like business and accounting, as well as management and finance. Classes a student may take include Issues in Business & Society, Management Science, and Organizational Behavior. The university recommends that students visit the College of Business Management and their Advisement Center for a consultation on the student’s expected plan of study. Students who want to continue into the Master of Science in Accountancy after earning a bachelor’s degree in accounting can enroll in the online-only program with a major in Accounting or a concentration in Forensic Accounting. The Master of Science in Accountancy requires students complete 33 credits over 11 courses. Students can enroll in part-time or full-time schedules, and students who graduate from the program can use the credit hours to satisfy CPA licensing requirements. Students should have an undergraduate degree in accounting when they apply. If students choose the Forensic Accounting concentration instead, they’ll benefit from a degree in a swiftly-growing area of the accounting industry. Classes a student will take include Introduction to Forensic Accounting and Fraud Examination, Financial Statement Investigation, and Forensic Accounting Valuation. Students who don’t want to enroll in a complete degree program can also consider the Advanced Certificate in Forensic Accounting and Valuation. 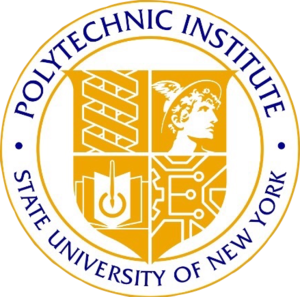 SUNY Polytechnic Institute is a public university located near Utica in New York. When it was founded in 1966, the school used classrooms at a local primary school to deliver instruction. The school would eventually transform into the SUNY Institute of Technology and would undergo a name change to its current moniker in 2014. The first classes offered at the university were offered solely at the graduate level, but the school began offering upper-division programs in 2002 and first-year undergraduate programs in 2007. The suburban campus today covers 762 acres in Marcy, New York, and around 2,600 students attend the university at that location, as well as a satellite campus in Albany. The school’s official colors are gold, blue, and white, and students participate in NCAA Division II games as the Wildcats. The regional accreditation agency for SUNY Polytechnic Institute is the Middle States Commission on Higher Education. The university is also accredited by New York State’s Board of Regents and is registered to offer academic programs from the State Education Department. Individual programs at the university are also accredited. The Commission on Accreditation for Health Informatics and Information Management Education has accredited the program in health information management, and the Commission on Collegiate Nursing Education has accredited the undergraduate and graduate programs at the university. The Engineering Accreditation Commission of ABET has accredited the Civil Engineering and the Electrical & Computer Engineering programs, and various business programs are accredited by the Association to Advance Collegiate Schools of Business. SUNY Polytechnic Institute shares that admission to the university is competitive, and requires suitable academic qualifications and recommendation letters. International students must pass an English proficiency exam. The university requires that students achieve a minimum score of 1,110 on the SAT or a minimum score of 24 on the ACT. Admission to the university as a graduate student usually requires application materials specific to the college or program to which the student wishes to apply. For example, the Master of Science in Accountancy requires that applicants have a bachelor’s degree from an accredited university. Students who don’t have an undergraduate degree in accounting must complete prerequisite courses before gaining eligibility to enroll in graduate-level accounting classes. Tuition at SUNY Polytechnic Institute varies based on the level in which a student is enrolled, as well as his or her residency status. New York State residents taking at least 12 credit hours will pay $3,435 per semester for undergraduate tuition and $5,545 for graduate tuition. Out-of-state residents will pay $8,325 for undergraduate tuition and $11,325 for graduate tuition. Students may also be assessed at a per-credit rate of $286 per credit hour for New York State residents taking undergraduate classes and $462 for graduate classes. Out-of-state residents will pay $694 per credit hour for undergraduate classes and $944 per credit hour for graduate classes. Some programs will require other fees or different tuition rates. For example, students must pay a Comprehensive Student Fee of $684 that covers a Health Service Fee, Technology Fee, Intercollegiate Athletics fee, and others. SUNY Polytechnic Institute reveals that more than 85 percent of its students receive some type of financial aid through the Financial Aid Office. Students who want to qualify for aid must submit a FAFSA form. The university recommends that students complete the submission as soon as possible after January 1st. Students may be eligible for several types of aid including federal student loans, scholarships, grants, and the federal Work-Study program. Scholarships through the university are available for first-year students, returning students, transfer students, and others. Some of the scholarships available include merit scholarships, which are awarded to students in the top 20 percent of their graduating class and the President’s Opportunity Fund for Student Success Scholarship, which is available to returning students who have demonstrated academic aptitude. Students interested in any of the accounting or finance programs at SUNY Polytechnic Institute should inquire with the university about program-specific aid opportunities.